YoYoFactory® is US-based company founded in 2003 by International Yo-Yo superstar YoHans (Hans Van Dan Elzen). YoYoFactory® designs and manufactures some of the world's best performing Yo-Yos for professional players, World Record holders, National and World Champions. YoYoFactory® also makes the best Yo-Yos for kids on the corner trading tricks, the player who knows just enough moves to impress their friends, or even that uncle who ‘used to be a champion. Whatever the status, YoYoFactory® has the Yo-Yo to suit every skill or style. Check out our range below! YoYoFactory are so happy to share with you the completion of the original innovative series.. In 2010, YoYoFactory set the goal of producing a modern performance plastic/metal hybrid yoyo th.. Superb Beginner's YoYo! The goal with the One yo-yo was to bring a yo-yo to the table that was ..
Protostar's Shape and the ONE's durability equals Superb YoYoing! Paul Han is a yo-yo legend. A..
Meet the Paolista! YoYoFactory's new signature model for Brazilian National Champion, Paolo Buen.. The YoYoFactory PLUS is a newest beginner level yoyo that is suitable for any beginner! W..
One of THE most impressive all-plastic YoYos available! In collaboration with 2008 World YoYo C.. 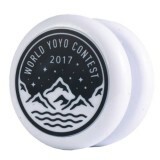 Designed for World Yo-Yo Champion Gentry Stein, the Replay is a responsive,performance yoyo that.. The Reply Pro is the new signature model from 2014 World Champion YoYoFactory team member, Gentr.. This is the perfect spintop to learn with! Made with a tough polycarbonate body to take i.. The YoYoFactory Shu-ta is the result of a collaboration between 2012 World Champion Shu Takada, ..
Gentry Stein's New National Title Winner! Introducing the Shutter, Gentry’s third signature rel.. Ever since the original Shutter was launched in 2013 there have been small changes made to .. The next step in horizontal finger spin technology is here! The Space Cadet implements a .. 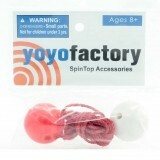 The YoYoFactory Spin Top Accessory Kit has everything you need to customize your favorite YoYoFa..